Wall Street Potholes shares insights into the money management industry, revealing the shady practices that benefit the salesman far more than the client. Bestselling author Simon Lack brings together a team of experienced money managers to give you straight-from-the-source intel, and teach you how to recognize bad advice and when it's better to just walk away. Investors are rightly suspicious that many products are sold more because of the fees they generate than their appropriateness to the client's situation, and that's only the beginning. This book lays it all bare so you can walk into your next deal with your eyes wide open. You'll learn just how big the profit margin is on different products, and why Wall Street intentionally makes things as complicated as possible. You'll learn expert tactics for combatting these practices, so you can avoid buying overpriced products and confidently discriminate against advisors who put their own interests first. For all the volumes of investment advice on the market, dissatisfaction with the financial services industry has never been higher. This book describes the reason for that disconnect, and tells you how to see through the smoke and mirrors to make the best decisions for your money. If asking questions of your financial advisor only nets more confusion, if you want to have more control over your money, you need a firm grasp of how these firms manipulate your trust. 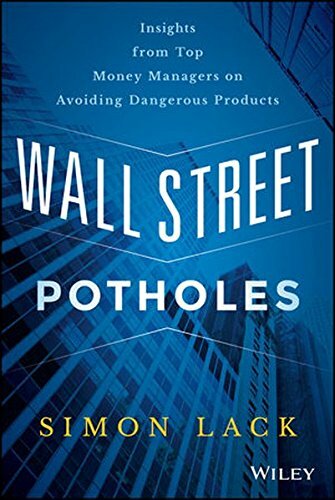 Wall Street Potholes tells you what you need to know to become a smarter investor.